Hey there, today’s post has me cooking for you again. I am sharing my no-grain/no gluten/low carb/ paleo friendly granola recipe. And all that might sound rather fancy and official but truth is, this is just a very yummy granola and that is coming from someone who isn’t a particular big fan of granola. Oh and stating that this will be a recipe is a bit too much honor too. It is more of a construction manual, a DIY tutorial so to speak. I guess it is the same with following craft tutorials and DIY instructions, in the end we all just do our own thing and that’s why everything is always an original. So when I was surfing the internet for some ideas about how my body was feeling could be linked to what I was eating, I came across this ‘eat like a caveman’, ‘paleo diet’, ‘grains are evil’ community. The community didn’t really ‘hit it off’ with me, nor do I necessarily follow all the reasoning behind why this would be the way to eat to save the entire human race. But some things stuck. Like the quest to stay away from all things pre-made, processed and factory grown and instead going back to real foods our ancestors would recognize as food too. That I liked. Oh and the fact that it would mean that any cookie or cake I’d eat would have to be baked by me, myself and I first. Now that will be a caloric restriction in and of itself. And then there were so many testimonials of people who seemed to have been feeling like I did and who started to feel so much better after cutting out the grains. It seemed worth a try. So I have been trying to get away from grains. I have a strong suspicion that my body will do better without them, so I have been cutting them out here and there until I am practically grain free these days. I think I am feeling better, although there is no life-changing difference in me just yet. But what would you expect after 40+ years of a grain filled diet. We’ll see. I miss my bread and pasta’s much less than I feared. It is the convenience I miss most. I have to actually think and plan ahead about what I eat for all three meals these days. No more quick peanut butter sandwiches or pasta with a sauce meals. That’s why I have been on the hunt for recipes that I can prepare once and enjoy for several meals after and that are just as easy and carefree as my previous way of eating. And this granola recipe fits that bill. It is easy and quick to make. I love the taste and it doesn’t feel like ‘diet’ food in any way. 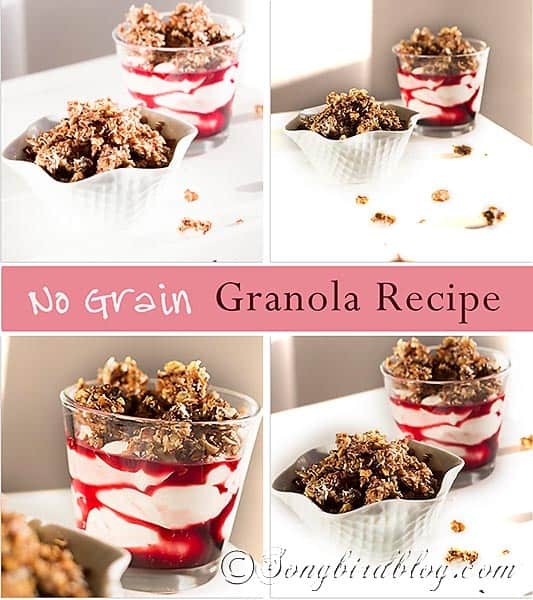 With “recipes” like this granola who needs grains?! It is yummy, easy and depending on your chosen ingredients, not even that expensive. Oh, and if you are an Ikea fan like me and that glass up there seems awfully familiar, you are right. It is the glass left over from one of their fragrant candles. I love the brown Fall scented candles from Ikea (do not like any of the other smells they have though), and I safe the glasses to use later on as candle holders or for serving food. They work well to dish up a dessert like this. 3 cups of nuts ( I use a lot of walnuts because I like them and get them for free from friends, hazelnuts because they grow locally and are cheap and usually one cup of mixed unseasoned nuts from the grocery store. Oh and there is always a handful of almonds in the mix too, because they are so yummy and healthy). 1/2 cup of coconut flakes. Combine nuts and seeds in bowl and cover with water, let soak overnight, drain and rinse thoroughly until water is clear (if I forgot to do this I sometimes skip this step, apparantly it is healthier and I like it because it makes the granola more chewy). Soak dried fruit (especially raisins) over night in small amount of water (just barely covered), do not drain (raisins in particular need to be soaked, if I forgot the night before I soak them for at least an hour before moving on with the recipe). Add drained nut/seed mixture and pulse until small chunks. Add flavorings and combine swiftly. Spread mixture on cookie sheets (use parchment paper), drizzle honey or syrup over it (you know how sweet you like your granola. I usually only use about 2 tbs of honey, or skip this step entirely and sweeten your yogurt instead), sprinkle coconut flakes on top. Put in lukewarm oven (120 C / 250F) for 45 minutes. I usually turn the oven off then, but leave the cookies sheets to cool in the closed oven. I love this with a Greek style yogurt and a banana for breakfast. Are you liking my recipes? Have you tried any? If you do send me a pic and I will share it here. Oh I love this recipe! I became a vegetarian last winter.We eat allot of pasta and bread.I can’t imagine not eating it.Not sure what I would eat LOL.We do like rice too.But we mostly eat fruits,veggies,nuts and beans. This granola looks delicious! I’m also on a quest to eat healthier and will definitely be trying this recipe. This sounds so wonderful. I try to eat low carb, so breakfast is always a hassle because I get tired of eggs. I pinned this and will be trying it soon. Thanks for sharing. That sounded so good, I have got my try in the oven at this moment 😉 I`ll let you know how it worked out. Hi Marianne, sounds wonderful, and I have copied the recipe. I will make(start) some tonight as I have all the ingredients!! Your photos are beautiful, real eye candy. I think the granola was delicious but the 120 C / 450 F was wrong. Did you mean 250 F.? That’s what I did mine at and it turned out great. Let us know as I was tempted to go to 450F but that’s a really hot oven. Oh, I really do need to get better at these conversions. So confusion. The oven needs to be warm and not hot. Good on you for spotting my mistake. Glad you liked the granola!! I’ve learned a lot about eating and “gut” issues from The Healthy Home Economist. She’s a great source for wellness. For me…nuts are expensive…but this looks really good. I’ve been reading about soaking nuts…glad to hear your thoughts, too. It is a bit challenging to eliminate all grains and sugars…I’ve done it before. But…my dear husband bought me the most wonderful chocolates for Valentine’s last year….I haven’t yet recovered! haha!! Nuts are expensive here too. That’s why I always try to include a bunch of them that grow locally and that I can get for free or cheaply. But I do love nuts and with moderation they are so healthy. So far I can handle the elimination of processed sugar pretty well. Especially since I am still allowed extra dark chocolate. I love that! Thank you for this amazingly simple, and delicious recipe. Can’t wait to try it with different combinations of nuts and seeds! HI! This sounds wonderful. I wondered, is there a serving size you recommend or is this a single serving? Wasn’t sure. Thank you!